The primary purpose for this project is to address sanitary sewer overflows occurring in the Lower Howards Creek Watershed to insure compliance with the terms of a Consent Decree from the Environmental Protection Agency as well as with Section 106 requirements. The project includes 5 miles of gravity sanitary sewer line (sizes ranging from 12-in to 42-in diameter), 3.4 miles of sanitary sewer force main (24-in diameter), one sanitary sewer pump station (10 MGD peak design), one Waste Water Treatment Plant (2 MGD average flow / 10 MGD peak flow), and two flood studies (watershed size of approximately 5 square miles each). Environmental work on the project site included a Phase I Environmental Site Assessment, a Cultural Historic Resources Survey, stream and wetland delineations, Indiana bat habitat assessments, and threatened and endangered species surveys. A preliminary jurisdictional determination with a request for a U.S. Army Corps of Engineers 404 permit was submitted. A Kentucky Division of Water Floodplain Permit along with a 401 Water Quality Permit will be submitted. This area contained some of the best examples of historic rock turnpike walls in Central Kentucky. Cultural historic project staff identified and evaluated historic properties, prepared the Cultural Historic Resources Survey, and assisted in redesigning of the project to avoid adverse impacts to historic rock walls, features of a Cultural Historic Landscape. This project is funded through the SRF Program. Palmer Engineering prepared the Fund A application for $36,600,00 to fund several consent decree-related projects in the areas as described above. 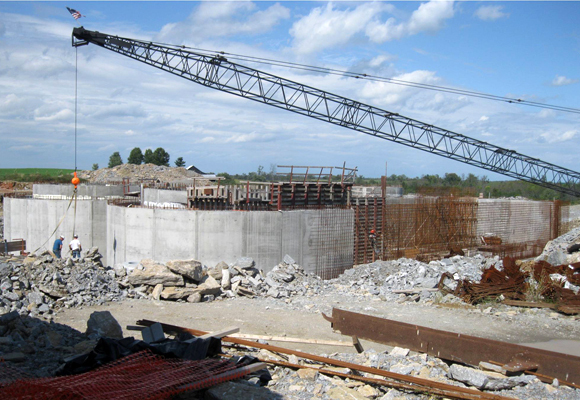 The Palmer Engineering Team worked together during the site selection process for the waste water treatment plant to determine the most environmentally appropriate site. The team also worked together to determine gravity and force main sewer corridors with minimal impacts to avoid the need for individual 404 permits.